IP012: A new reference of the prestigious Spanish Techno label Injected Poison Records. After a year since from her last release on vinyl, during this time, we have been able to see some of her releases in digital format, but, It's vinyl time , we have generated enough waiting and now we can enjoy a powerful vinyl, with a magnificent work of art and design for collectors and four powerful tracks with 3 of the best producers of the Techno scene. We are proud to welcome our well-known label partner Christian W nsch and a new member of the Pole Group; P.E.A.R.L. At the vinyl we can listen two original tracks from the owner of the label, Jose Pouj, with two remixes of Christian W nsch and P.E.A.R.L. The release date will be available in September. Enjoy. --- IP005: Almost two years have gone by since the team at Injected Poison Records launched its previous vinyl record. 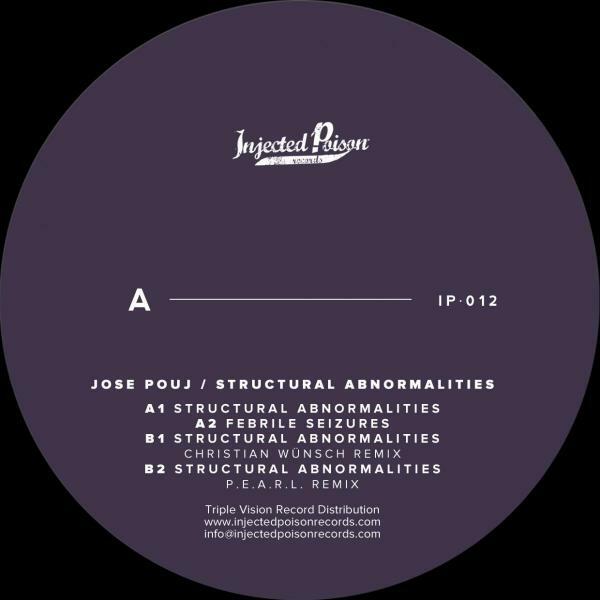 Now, the label headed by the Spanish artist Jose Pouj brings us its fifth release. Available on vinyl and digital, this issue will be jam-packed with the best and most up-to-date techno, because they have enlisted the most outstanding Spanish producers: Oscar Mulero, Christian Wunsch, Exium and the label's boss himself: Jose Pouj. Side A of The Structure opens with 'Sound Mirror': Oscar Mulero's unmistakable sound envelops a track full of melodic atmospheres, deep percussion, synths that come and go... All wrapped in reverbs that are impossible to describe. A great work by our great master Oscar Mulero. Side A's second track is 'Mutation', brought to us by Christian Wunsch, a Cantabrian born in Monaco who is behind Tsunami Records. This is a classic 4x4 track with a relentless bass line and never ending atmospheres that verge on darkness. Pure Wunsch sound. On the flipside we can listen to 'Repeating Future'. The first track of the B side is a work by Asturian duo Exium, whom we also know as Hector Sandoval and Valentin Corujo. This track is slightly different from what we are accustomed to hear from these producers: a great and dynamic structure which is innovating, whilst retaining the characteristic sound of the duo. The EP closes with 'The Structure': produced by Jose Pouj, the label's chief, this track is loaded with forcefulness and a very well processed action. Sharp percussions and progressive filters take the centre stage in this great synth exercise, where the dense bass line helps to produce an exquisite end result. This production definitely adds up to the curriculum of this contender to the European techno dance floors. In a nutshell, this is a fantastic EP made up of the best sounds of the moment.